Extensive coordination between an operator and Packers Plus resulted in the completion of the world’s first multi-stage, multi-lateral offshore well. Both legs were installed with 14-stage StackFRAC® HD systems and treated with acid. From installation to stimulation, operations for the dual lateral well were completed as planned, within a total of 12 nonconsecutive days. The success of the on-time and on-budget project is attributed to a strategy emphasizing simplicity, efficiency, and the anticipation and mitigation of operational risks. An operator in the United Kingdom focused on oil and gas operations in the North Sea was seeking a low-cost completion solution for its offshore development. With multiple target reservoirs in the same area, the operator required a solution to maximize stimulation effectiveness and minimize cost. To provide the most cost-effective technology solution for the project, the Packers Plus team designed for simplicity. Using a TAML level 2 multilateral junction, and proposing the same straightforward and proven StackFRAC HD design for each leg, the completion would be able to access two separate reservoirs from a single wellbore. • Planning the second leg to be drilled far enough from the first to avoid inter-wellbore communication. The 14-stage offshore dual lateral was completed on schedule and under budget. This innovative offshore dual lateral was drilled, completed and stimulated within three months. Outside of drilling, installation to stimulation operations for both legs were completed within a total of 12 non-consecutive days. 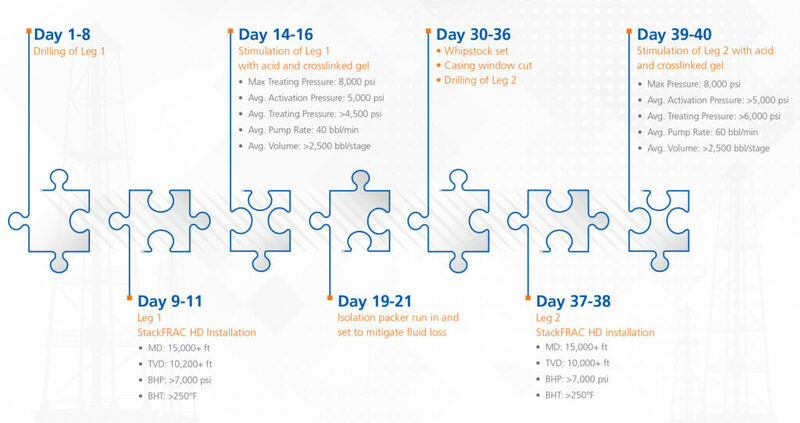 Leg 1 was drilled and the 14-stage StackFRAC HD system was installed in 2 days. To minimize non-productive time, the well was stimulated immediately after reaching setting depth. The 14 stages of acid treatments were completed in 3 days. Once operations were complete for the motherbore, a whipstock packer was set and the second leg was drilled. Leg 2 was installed in 2 days, using the same setup and system as the motherbore, and later stimulated over 2 more days. With over a year’s worth of planning and coordination, this offshore acid-fractured dual lateral was completed on schedule, and lower than the estimated cost. Besides introducing the operator to operational and economic efficiencies, the well has already shown higher than expected initial production. Packers Plus provides field-proven and cost-effective solutions to complete horizontal wells in a range of formations and applications around the world. These include single point and limited entry systems, testable toe sleeves, stage tools, liner hangers, as well as offshore and multilateral solutions. Please enter your email address to download the PDF.